or a band that wants to play loud enough for every one to hear ( in the whole world)? never complains and plays the music when you want it at the volume you like. from the 1950's,60's and 70'for weddings, celebrations or any special party. We have a CD library of over 10, 000 discs and can supply any other music by request. All together the OMT is a very impressive jukebox in terms of sound quality, reliability and aesthetic appeal and is a centre piece at any party, with the varying colours and bubbles giving a self contained lightshow. The 'One More Time' (OMT) is an excellent replica of one of the most popular jukeboxes ever made the Wurlitzer Model 1015 introduced in 1946, of which over 56,000 were sold. Solid state and computer driven, the OMT has 200 watts of power (100 watts per channel) and a six speaker sound system. This state of the art technology is combined with all the nostalgia of the original 1940`s machine, with chrome fixtures, bubble tubes and rotating coloured lights. The carousel holds 60 Compact Discs offering over 900 different selections, the artists and song titles for which are displayed in a programme holder on the front of the jukebox. 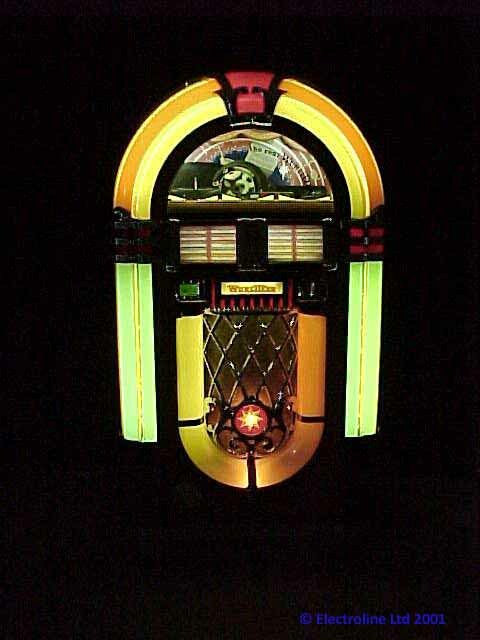 Selections can be made easily by the number buttons and the jukebox can play with hours of continuous music.